Thank you to Random House UK, Cornerstone for supplying this e-arc via Netgalley in exchange for an honest review. All quotes used in this review come from an advanced copy and may not match the final copy. *There are a lot of characters in the book so I really recommend writing their names down because chances are, they’ll turn up again later! Okay, so right off the bat I want to say this: Don’t compare Daisy Jones & The Six to The Seven Husbands of Evelyn Hugo. They’re nothing alike, absolutely and completely different. Content-wise they’re set in different scenes and the characters are completely different. Please don’t pick u this book because you think they’re going to be anything alike. Daisy Jones keeps it real. There are some amazing quotes but the actual story ain’t that deep folks. Okay, so it is deep, there are a whole load of complex themes in play but they never feel fully fleshed out because the story is told through an interview format which never enables the reader to properly get to know the characters on a deeper level. Would make a great mini-series and I think it’s actually becoming one??? It felt real, like this band was real and all of this had really happened. I don’t think the story was bad, but I do think it was being told in the completely wrong medium – this story was made to be told in another way. I really think this is going to work so much better as a mini-series so thank god, Resse Witherspoon is adapting (for Amazon, I think). If you enjoyed the behind the scenes look of Queen in Bohemian Rhapsody and the behind the scenes look at songwriting in A Star Is Born you will LOVE this. But, other than that, I think Daisy Jones is going to be a miss for a lot of people, it certainly was for me. I just had this overarching “meh” feeling while reading this. I wasn’t quite disappointed because I knew there were a lot of average & DNF early reviews but I was expecting to either LOVE or HATE it. I don’t really like books about bands or music in general, so I was a bit unsure how I would feel about this book, but the music was actually the best thing about this book – it was really interesting to see how the songs were written! Daisy Jones & The Six felt weak. It wasn’t until the last 10% of the book that I actually started to care what happened and I didn’t want the story to end. But, for the other 90% I was just waiting to start caring. I know that sounds harsh and I don’t mean to be, but this book had so much potential and I just don’t think it made sense in this medium! The way the story is told is interesting but emotionless. You can’t see how the characters are feeling, I was listening to this on audiobook and reading along with my arc copy and honestly, the audiobook made such a difference to how I consumed the story! The audiobook gave the characters depth and emotion – it gave me more of a chance to know and understand them because the narrators did such a fantastic job! Honestly, if I had just read Daisy Jones & The Six on my Kindle like I originally intended to, I probably wouldn’t have finished the book, or at least I would’ve given it a much lower rating. The characters in this book are manic and suffocating. You hear about all the characters’ struggles but you never feel it. They tell you how vulnerable they are but they never feel vulnerable when you’re reading their words. This book has some really good point and has resonated with a lot of people so I won’t not recommend this, but for me, it really missed the mark. I enjoyed the team dynamic and the behind the scenes aspects of making the music but the characters just felt skin deep and I never felt like I really got to know them. Recommendations: There’s an index at the end of the book which is really helpful for extra context! I also really recommend writing up a character guide while you read! 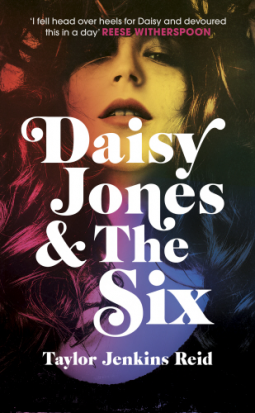 Have you read Daisy Jones & The Six? Posted on March 18, 2019 March 22, 2019 by EllynPosted in Book ReviewsTagged arc review, reviews. Next Next post: DVD TOUR RECOMMENDATIONS #1 // A Semi-New Series + The Series on My Shelves! Thanks for the review! This is the first more ‘negative’ review I’ve seen! I’m happy I was already planning on to listen to it on audiobook! I try to include both positives and negatives in all my reviews, but sometimes the bad outweighs the good! That being said, the audiobook is really good and definitely worth a listen – they even include a song at the very end!